TOGA Pulla fur moto jacket (similar here), Mossimo cropped sweater, Lace-trimmed blouse c/o Black Swan (similar here), Jbrand jeans, Rebecca Minkoff Waverly crossbody bag, Nine West printed pumps. Shot by Erica Lavelanet. NYFW may be over, but the excitement of it all is still pumping through my veins, and I'm still sorting through the bulk of images that I took to determine what's worth sharing with you guys. The above look stood out as one of my favorites I wore all week, mostly because I really love the mix of textures and prints going on: from the classic-prep sweater, shirt collar and pumps, to the rocker studded bag, moto jacket, and singular earring. I then topped it off with some funky green eyeliner to add a little color to an otherwise mostly black and white ensemble. The same mix of ladylike edge was apparent at both the Zimmermann and Honor shows, which each happened to be held offsite at the same gallery space in Chelsea. Zimmermann has long been one of my favorite designers (you might remember I bought my dress from my sister's wedding there) and they didn't disappoint this season, rolling out a bevy of colorful, bohemian dresses and 70s inspired looks that were equal parts rock and refined. Honor's collection was more traditionally feminine and romantic, with voluminous silk gowns, embroidered dresses and Victorian-style blouses in bold colors. Check out some of my favorite snaps from both shows below! 1. Show-stopping color blocking on the Zimmermann runway. 2. 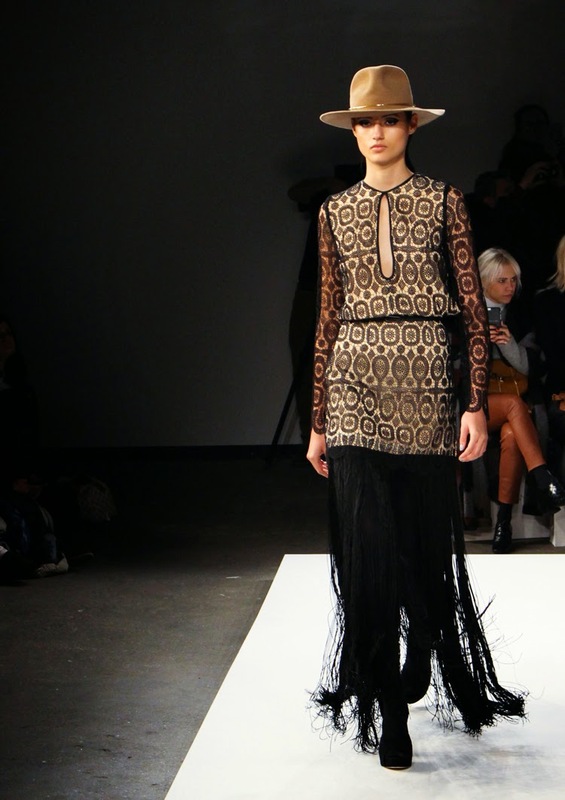 I would easily wear this Zimmermann look from head to toe! 3. Some well-placed cutouts give this boho Zimmermann dress the perfect amount of edge. 4. 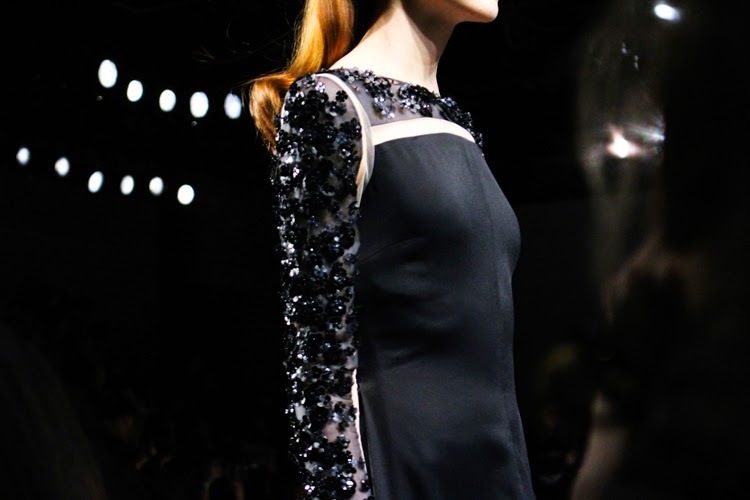 Intricate adornments, like these beaded sleeves, were a staple at Honor. 5. Pretty and polished on the Honor runway. 6. Bold, rich hues added to the collection's feminine flair at Honor. Love Honor's collection, and your layering plus the palette works so well - such a gorgeous look! Love the fur and leather combo! The bag is gorgeous! Obsessed with your patterned heels. You look so chic!